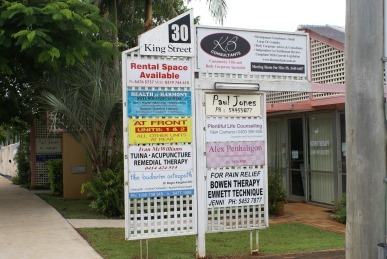 From Buderim shops, travel East on Main Street past the primary school. Main Street becomes King Street, and 30 King Street is on the right hand side, next to St Mary's Catholic Church. From Maroochydore, follow Mooloolaba Road towards Buderim. Mooloolaba Road becomes King Street, and 30 King Street is on your left. Limited on-site parking is available at the rear. Bus: Route 616, Sippy Downs to Maroochydore, 'King St at Water St' bus stop.